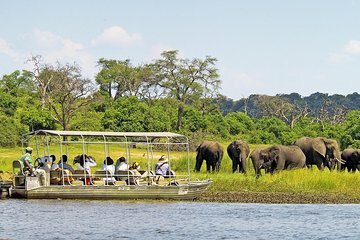 Get a first-hand peek at some of Botswana’s most famous animal inhabitants—including lions, hippos, and elephants—on this small-group day trip to Chobe National Park. Enjoy two opportunities to spot wildlife, with both a leisurely river cruise and adventure-filled jeep safari ride. Tours include private round-trip transfers from Victoria Falls, a tasty on-site lunch, and Zimbabwean and Botswanan guides. That tour is definitely a must for those stay in in Vic Falls! Excitiing combination of land and river safari and a really good lunch in between.